Jodie Whittaker, The Thirteenth Doctor. When the show was rebooted in 2005 with Christopher Eccleston's ninth Doctor I was back in for his entire one season run. It was kind of a shame Chris didn't stick around for long because I really liked his Doctor. As I heard Colin Baker say in some Doctor Who Reunion show at one point, Chris' Doctor was the 'cool' Doctor that he wanted to be with the leather jacket. Somewhere in the middle of David Tennant's run as the tenth Doctor I fell off the wagon again. I'm not sure why because David Tennant is by far one of the best Doctors in the role. Almost to the point where I feel Matt Smith's eleventh Doctor pretty much takes everything that was great about David's version and just tweaks it to be a little more Matt Smith ("Bow ties are cool, right?"). All of this is the long way of saying, these days I check back in with the show every time there is a new Doctor. I really like the character and find it extremely interesting to see each new actor's take on the role given long history, and numerous actors for them to draw upon. Unlike Colin Baker, when Matt Smith took on the role, for me he was the Doctor from the moment he said his first lines. Probably because he wasn't that far removed from David Tennant's Doctor. Matt definitely brought his own energy to the role but I think his mark on the character was more gradual. Peter Capaldi's twelfth Doctor had a similar jarring effect for me as Colin Baker but this time I stuck with the show for his full first season because I felt his Doctor was a little bit of a mix of the first (William Hartnell), third (Jon Pertwee), and fourth Doctors (Tom Baker), all of whom I kind of liked in various ways. 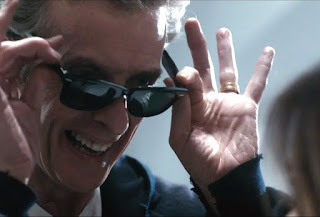 Sonic Sunglasses - Just like ordinary sunglasses really. Unfortunately I was out on Peter's Doctor when they started to 'rockstar' him up with playing guitar and replacing the sonic screwdriver with sonic sunglasses (WTF - they didn't even look cool, they were just regular sunglasses to anyone not in the know). I will say the show opening title sequence for his Doctor is my all time favorite with all the gears and Victorian style clockwork going on. When it was announced that the next Doctor would be gender swapped I was all in to see how that would work. It's not that I thought it wouldn't work but I'd just never seen it before so I was really interested to see where that might go. I also wasn't that surprised about the gender swap since I'd seen the run of episodes with Missy (Michelle Gomez), formerly known as the Doctor's enemy, The Master. Which I don't recall anyone really making a fuss about. Largely because it was done by stealth with the character not being revealed as The Master until after we pondered who she was over the course of several episodes. At the time of writing this I've seen the first five episodes of Jodie Whittaker's first season as the thirteenth Doctor. I also saw the episode at the end of Peter's run where Jodie first appears. Although I've seen Jodie in the TV series Broadchurch, her role in that wasn't memorable enough to stick her in my mind. Which is not to say she wasn't good in it, I just didn't make that connection until just now, when I looked on her IMDB page to see if I had seen her anywhere before. So the first time I saw her as the Doctor she was virtually a complete unknown to me. Even seeing her face didn't jog my memory of having seen her somewhere before. However, her performance as the Doctor, for me is pretty much spot on. Like Matt Smith, she was the Doctor from her first line of dialogue. Partly because her Doctor does seem very influenced by David Tennant's and Matt Smith's Doctors I feel. Their Doctors were both very charismatic and likeable. Jodie's Doctor is too. It makes me wonder what might have been if her take on the character was more jarring like Peter Capaldi's or Colin Baker's? 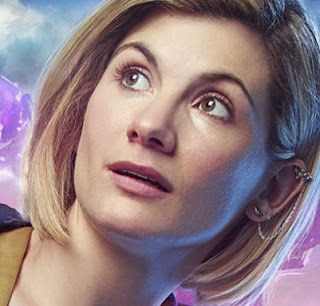 If I'm honest, I was kind of hoping for something completely different that would be challenging to like at first, but Jodie's Doctor is so damn likeable, quirky, and yet, completely capable and authoritative, you can't help but like her right out of the gate. Probably my only disappointment with the new season so far is there doesn't seem to be any long term story arc/mystery. Something along the lines of the 'Bad Wolf' storyline from the ninth Doctor, Chris Eccleston's series, or Missy's presence through series eight of Peter Capaldi's first season. I'm really hoping they'll do something like that, if not this season then maybe the next. Otherwise I think the thirteenth Doctor is off to a great start. These early episodes aren't particularly memorable in terms of their storylines but they're giving Jodie time to really settle in whilst we wait to see her go up against some of the series more iconic foes.